Cocoa Casino: Not the Best Casino Choice? 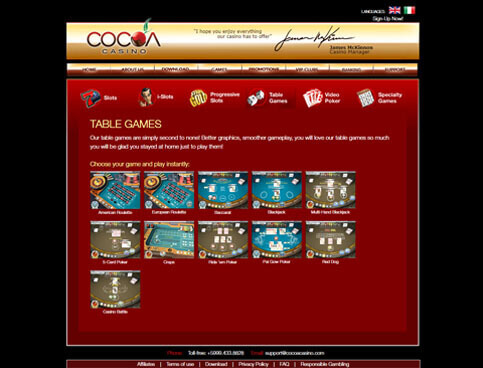 Cocoa Casino is one of the 10 online gaming hubs operated by SSC Entertainment NV Casinos. Launched in 2006 and licensed in Curacao, the casino claims to be one of the top gaming portals in the world. Aiming to maintain its status, it provides an exciting gaming experience through top-notch games and attractive bonuses. In addition, the betting site strives to promote integrity by resolving issues in a professional and timely manner. But does Cocoa Casino live up to its claim of being one of the best casinos in the world? One way to find out is by becoming a member. To start, you must check if online gambling is legal in your country. Some casinos list country restrictions in their Terms and Conditions, but Cocoa Casino does not. Instead, the gaming portal gives you the responsibility of making sure you can sign up and play with real money without running into legal issues. 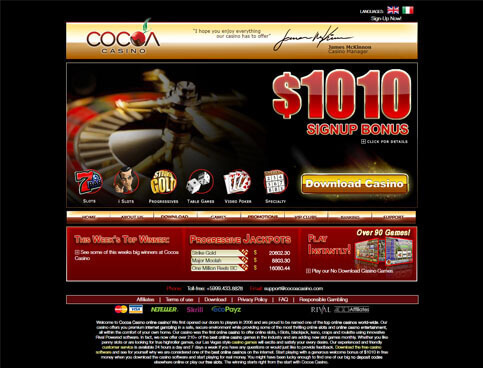 Afterward, you can proceed to signing up with Cocoa Casino. The casino recommends that you download its software, although there is an instant-play version on the site. Whichever mode you choose, you will be playing some of the best slots by Rival Gaming. Plus, the betting site guarantees quick and easy payments, whether you are using fiat or Bitcoin. As a new member of Cocoa Casino, you can get a US$10 bonus chip. This freebie lets you explore the casino’s game library without risking your real money. After claiming the promo, you have to roll over your bonus chip 50 times before you can claim your winnings. Moreover, the betting site will let you cash out only US$50 of your rewards. Once you have used your no deposit bonus, you can still get more funds through the Super Reload Bonus. Simply deposit US$25 or more, and you will get up to US$150 worth of free cash. This deal is subject to a 20x wagering requirement. Unlike the US$10 Free Chip, though, this bonus has no maximum withdrawal amount. If you are a high roller, you can start playing on Cocoa Casino with a huge boost in your bankroll. Just top up your account with US$100, and you will get a 150% bonus up to US$1,500. Keep in mind that you must roll over your deposit and bonus money 35 times in order to claim your rewards. In addition, you cannot cash out if your account balance is less than your bonus funds. As your rank increases, your benefits increase as well. Some of the perks you will get include expedited cash-outs and personalized welcome bonuses. Plus, if you become a Club Diamond member, you get 40% cashback on your deposits. These are not the only bonuses found on Cocoa Casino. The casino also has a comp points system that lets you earn points for every real-money wager you make. These points are convertible to cash. Additionally, the gaming portal gives you a US$50 incentive for every referral you make. With so many rewards in store, you definitely have more reasons to keep playing on Cocoa Casino. Cocoa Casino’s game library consists of 100 titles by Rival Gaming. Most of the titles in the collection are slot games, from classic three-reel slots to slots with progressive jackpots. The highlight of the game selection, however, is the iSlots. The games under this section not only give you a chance to earn huge rewards, but also immerse you in a story line that changes as the reels spin. Apart from slot games, the casino offers roulette, baccarat, blackjack, and poker. There are also a couple of specialty games such as keno and sudoku. While there are only a few variants of these games, this should not be an issue if you prefer to play Bitcoin slots. Unfortunately, the gaming hub does not have a live casino. This will frustrate you if you want to experience playing with fellow gamers or live dealers in real time. Overall, the game library of Cocoa Casino is not as impressive as what other casinos offer. There are only a few titles in the gaming hub, unlike on other betting sites housing hundreds of titles. If you are looking for variety, this gaming portal is definitely not for you. Although its list of banking options is not as extensive as that of other casinos, Cocoa Casino offers reliable payment methods through cards and e-wallets. In the Cashier section, you can choose your preferred currency: USD, GBP, EUR, and BTC. Keep in mind, though, that the payment methods change depending on your location. Before you place real-money bets, you must fund your account first. For all banking methods, Cocoa Casino requires you to deposit at least US$25. Your chosen payment option may charge you with additional fees as well. Once the casino receives your payment, it will credit the amount to your account instantly. Cocoa Casino’s cash-out methods make claiming your winnings easier. But compared with the deposit channels, there are fewer options for withdrawal. The minimum amount you can withdraw is US$50. For all channels, the general processing time is one to three banking days. Keep in mind that most of these payment methods are free. But make sure you check with your chosen cash-out channel if you will be charged additional fees. 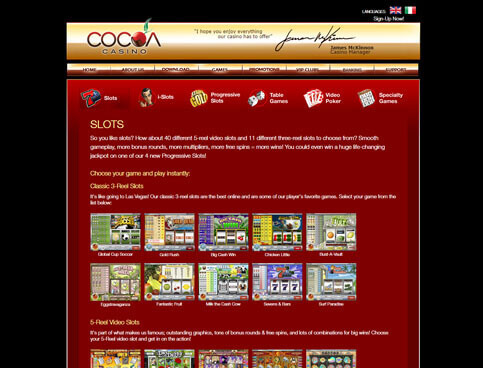 Unfortunately, Cocoa Casino does not live up to its claim of being one of the best online casinos in the world. If you want to play a variety of games, you will be disappointed with the size of the game library. Even if you get attracted to the rewarding bonuses, you can wager these deals on only a few Bitcoin slots. Plus, while the casino offers a variety of payment options, it has a slow payout period. While other gaming hubs process cash-outs within 24 hours, Cocoa Casino will release funds within one to three banking days. This will frustrate you, especially if you want to get your winnings right away. Based on what Cocoa Casino offers, you are better off joining another gaming hub.